Point level measurement devices: Monitoring or controlling level at a preset point, which could be either a low level or a high level. Point level detection is useful in applications where action needs to be taken at a specific set point. For example, shutting off a pump (for protection) if level has dropped below a required point, or to shut a valve to avoid over-filling a tank. Continuous measurement devices: Monitoring or controlling level continuously, noticing any fluctuations. They give continuous readings and can provide an output which can be seen or recorded in remote places. This type of measurement allows for continuous monitoring and control of parameters of any process. Direct level measurement: The direct method employs physical properties like fluid motion, buoyancy, etc. To measure level directly, the position of interface may be monitored visually through sight glass or by any device which is floating on surface. 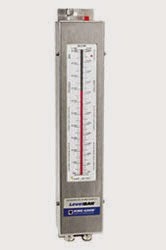 Displacers are also used for direct level measurement. Indirect level measurement: Indirect level measurement involves measurement of some other quantity, such as pressure, and converting it into a level measurement. An example is installing a pressure gauge at the lowest point on a tank. The change in pressure as the tank level increases or decreases can be used as an indicator of the change in the level of liquid inside the tank.